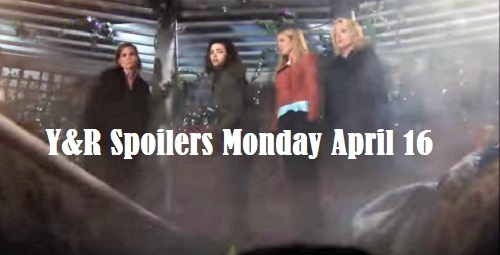 The Young and the Restless (Y&R) spoilers for Monday, April 16, tease that there’ll be a real mess to deal with at Victoria’s (Amelia Heinle) place. In Friday’s episode, Nikki (Melody Thomas Scott) attacks J.T. (Thad Luckinbell) with a fireplace poker. She’s desperate to stop him from hurting Victoria, so she just grabs her weapon and instinctively strikes J.T. in the head. On Monday, we’ll see the aftermath of that decision. Nikki just wanted to protect her daughter, but her move will come at a price. It looks like J.T. will be dead from a blow to the head. The Young and the Restless spoilers say the ladies upstairs will freak over J.T.’s lifeless body. They’ll wonder what they’re going to do now. Victoria will squat down by J.T. and lower her head. She’ll feel responsible for dragging Sharon (Sharon Case), Phyllis (Gina Tognoni) and Nikki into all this. Despite the good times Victoria and J.T. once shared in their relationship, she probably won’t feel all that distraught about his demise. Instead, Victoria will be worried about Nikki potentially going to prison. Nikki was defending Victoria, but J.T. wasn’t armed. That could easily become an issue in this case. Paul (Doug Davidson) and Christine (Laralee Bell) aren’t known for being smart or lenient, especially when Newmans are involved. The ladies may fear that Nikki will go for this, so they’ll start working on a cover-up plan. Meanwhile, Mariah (Camryn Grimes) will remain oblivious to the drama. She’s been sleeping off all those margaritas in the den, so she missed the abuse story as well as J.T.’s final faceoff with Victoria. The Young and the Restless spoilers say Mariah will eventually awaken and start looking for the others. She’ll hear a commotion in the bedroom, so she’ll knock on the door and ask if they’re in there. Sharon and the rest of the gang will panic over Mariah potentially finding out. Will they find a way to get rid of her? Regardless, Mariah’s sure to be suspicious about what’s going on. Across town, Nick (Joshua Morrow) will stop by Victor’s (Eric Braeden) hospital room. He’ll determine that his dad’s trying to tell him something important. Victor will once again use his tablet to spell out J.T.’s name and offer a clue. He’ll be desperate to expose his attempted murderer. Y&R spoilers say Nick will give J.T. a call, but it’ll obviously go straight to voicemail. Poor Victor will whimper as he struggles to make Nick understand the truth. It sounds like even more excitement’s ahead on Monday. We’ll give you updates as other Y&R news comes in. Stick with the CBS soap and don’t forget to check CDL often for the latest Young and the Restless spoilers, updates and news.